Painting with henna is one of the oldest arts of body decoration, a fashion which came into the modern world from the middle East. Today temporary tattoos made from henna paste is extremely popular because of its exoticism, health safety and environmentally friendly materials, which are used for such tattoos. The pattern of the henna stays on the skin for up to two weeks with proper care and learn how to paint hands with henna everyone can. To start prepare a paste for painting. To do this, take 30-40 grams of finely sifted and purified natural henna powder and pour the powder into a glass or enamel pot freshly squeezed juice of two lemons. In lemon juice you can add a spoonful of the just-ground coffee or strong black tea and two teaspoons of lime juice, which will make the color more intense. Knead the henna with a liquid, until it acquires the consistency of thick cream. Carefully RUB the paste in the container, to avoid lumps. Cover the container with pasta sealed with plastic wrap and leave it to infuse for a few hours. The longer infused pasta, the better to stand out the pigment, so it is best to prepare the henna in advance and leave it to infuse overnight. To apply a pattern brush, use a thin, pointed toothpick or a plastic cone. Cone is the most convenient way for applying henna. Take a piece of cellophane the size of 20х16 cm and roll it into a cone with an acute angle. Carefully seal the joints with tape or adhesive plaster, and then fill the bag with the paste of henna, which by that time should be ready, and then seal with tape the top edge of the cone. The bottom tip cut off to form a small hole from which the henna is squeezed out when pressed. In advance, prepare a sketch of the picture you want to apply to the skin, and if you doubt their abilities, make the skin cosmetic sketch with a pencil or marker. Trace over the sketch with henna, evenly squeezing it out of the cone. In the process of drying of the picture to moisten it with a mixture of lemon juice and sugar – this contributes to the manifestation of color. 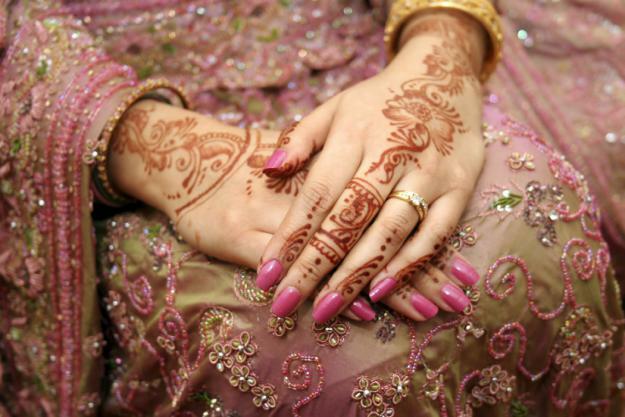 Keep the dried henna on the skin for at least four to five hours – depends on the intensity and brightness of the picture. Several hours later, gently scrape off the dry henna from your skin and you will see a bright orange pattern, which darken later in the day. For painting, use only natural red-brown henna so the black henna contains substances that can cause allergic reactions.